The dreaded “The remote server returned an error: NotFound” error message in RIA Services can be frustrating if you are not aware of what it really means, and more importantly how to diagnose it. This generic error message is due to network stack limitation in your browser, basically the browser is intercepting the error and not giving it all to Silverlight. That does not mean there isn’t good information to be found. Your friend here is Fiddler and/or WCF Service Tracing. NotFound vs OnError: A NotFound generally means that something in the WCF side blew up, OnError will handle errors in your model (or custom code in your DomainService). So when you see NotFound, overriding OnError will not be much help, break points placed inside of it will most likely not be reached during debugging, but its an easy place to start. If there is no good information in Fiddler then the next step is to hit your service url, which you can find in Fiddler. 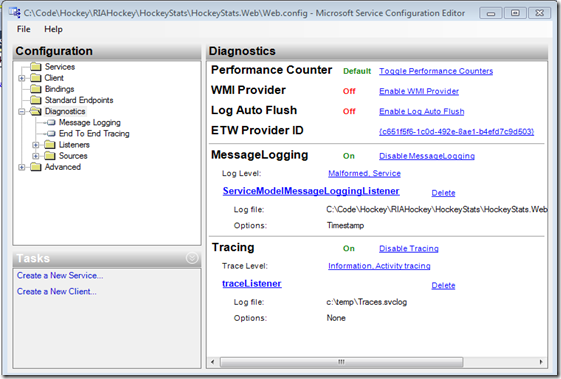 In the picture above you can see that my service is at /ClientBin/HockeyStatsService-Web-HockeyStatsDomainService.svc (ProjectName-Web-DomainServiceName.svc). Remember that RIA Services does not actually generate a .svc file for you, it is handled dynamically by the DomainServiceHttpModule, so don’t go looking for a physical file. Actual 404: If you hit your service in the browser and you still get a 404, then something is wrong with your deployment. Check out Saurabh Pant’s Blog or Tim Heuer for good articles on deploying WCF Ria Services to IIS. If you are using Casini (ASP.NET development server) then make sure your web.config is correct (Has proper references to DomainServiceHttpModule), and that you have a reference in your ASP.NET project to your service library (if you are using RIA Class Libraries, otherwise you should be fine on this point). Now if you can hit your service url without a 404, but still get a NotFound, and the Fiddler response tab didn’t give you anymore insight we will move on to some other steps. SvcTraceViewer: Visual Studio has a tool to help you configure WCF, it can be found under TOOLS | WCF Service Configuration Editor. Use this tool to open your Web.Config and then on the ‘Diagnostics’ folder, turn on Message Logging and Tracing. 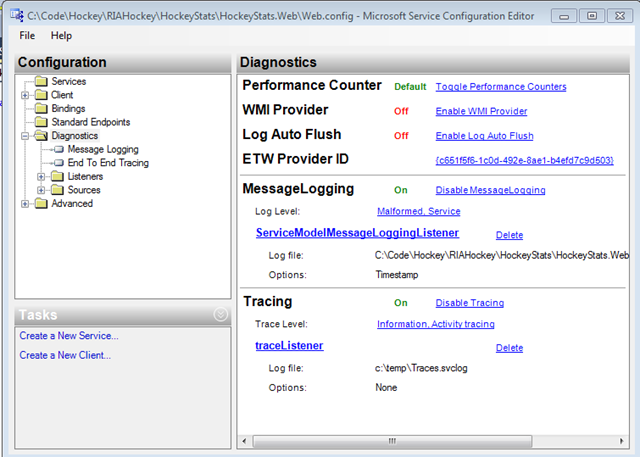 On the ‘Message Logging’ node, LogMessagesAtServiceLevel=true and LogMessagesAtTransportLevel=false. 'Maximum number of items that can be serialized or deserialized in an object graph is '65536'. Change the object graph or increase the MaxItemsInObjectGraph quota. '. Another good debugging tip is to turn off custom errors in your Web.Config. <customErrors mode="Off"/> This will provide more informative exceptions to silverlight, however it also exposes information to the user that you may not intend, so do not leave this set to ‘off’ on a publicly available site. If your error is the same as mine, take a look at Fixing the MaxItemsInObjectGraph.